1.) 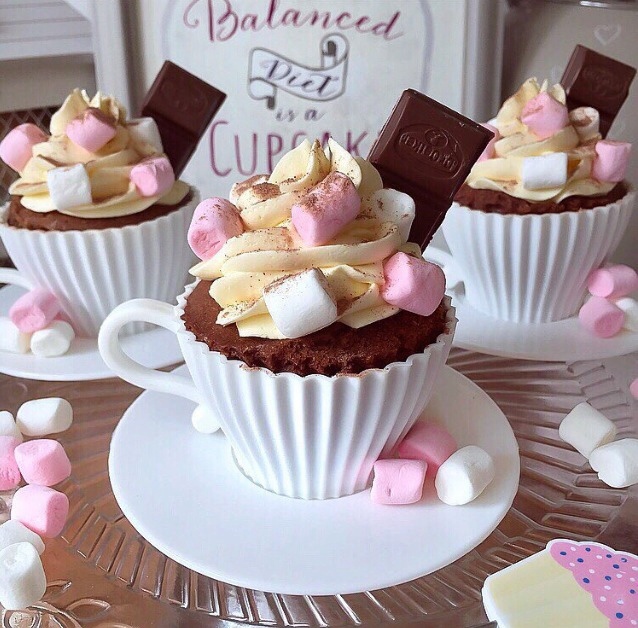 To make the tea cup cakes, place all of the cupcake ingredients into a mixing bowl and whisk them all together until combined. You could use a wooden spoon if you don't have a whisk, but this requires much more effort- aching mixing arm isn't the one. 2.) Place even amounts of mixture into 6 tea cup silicone cases. Go ahead and fill them roughly 3/4 full, over fill them and the mixture will spill out of the top and cause a hard top. Oh, and the cases are from Wilkinsons by the way! 3.) Bake on the second shelf from the top of a preheated oven 190 c/170 c fan/gas 5 for around 30/25 minutes, place each tea cup case onto a baking tray- it'll be easier to get them out of the oven. Tip: place a cocktail stick into the middle of one of your cupcakes to check it's fully baked. 1.) Whisk 125g worth of butter with a whisk for 5-10 minutes so it's extra fluffy and then sift 185g worth of icing sugar into the same bowl. 2.) Combine the icing sugar and butter, and whisk for a further 5 minutes. Tip: pop the finished buttercream into the fridge to set as it makes for neater piping. 3.) To pipe the buttercream onto the cupcakes you'll need to use a piping bag. You can pipe the buttercream on however you want so just choose the nozzle you like best- I used a Wilton 2D for these particular cupcakes. 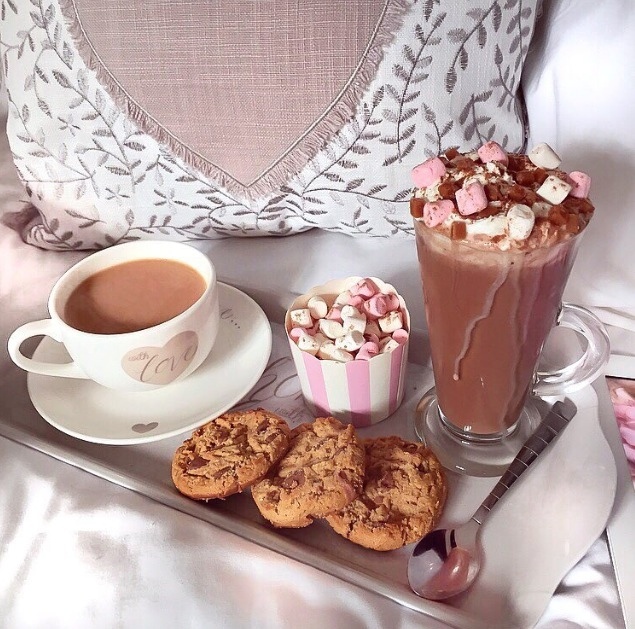 Then finish with a generous amount of mini marshmallows, two squares of milk chocolate and a sprinkle of cocoa powder, you should have now perfected that indulgent hot choccie look. I hope you like the recipe, be sure to let me know if you give them a whirl. 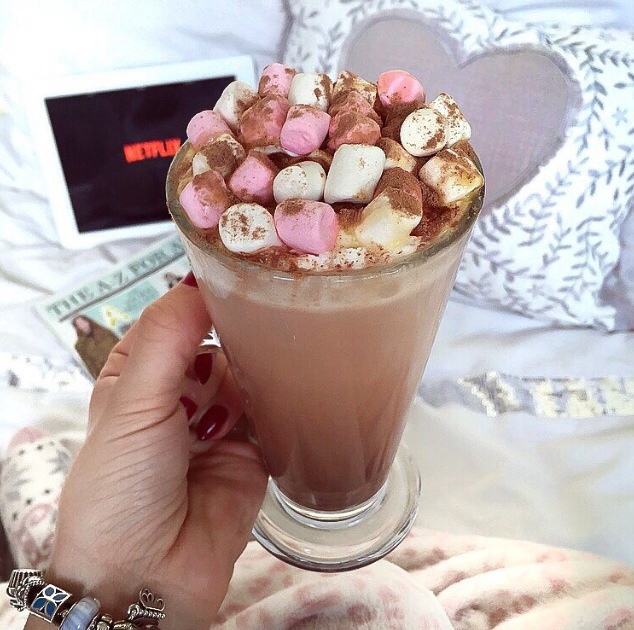 What's your favourite cosy night in treat?